Header: It doesn’t seem right that we are old enough to have kids. Woman: Sweet! We made a baby! Man: Are we sure we did it right? We should disassemble it, check all the parts and put it back together. If you are old enough to do something, it means that you have reached the age when you it’s ok for you to do it. sweet (adj.) /swiːt/ here it’s used as an adjective, like: Nice! or Cool! This comic strip is making fun of the fact that many people now are very knowledgeable in the field they studied and/or work in, but lack general knowledge. Because the comic series xkcd targets the field of engineers, there are probably many readers who would feel in the same situation as the two people presented in this comic. Do you know people like who would react like them? Notice the prefix dis- in the verb disassemble. 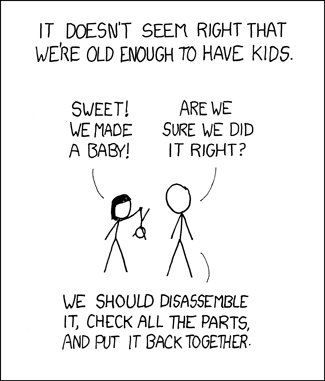 babies, common sense, dis-, disassemble, engineer, kids, prefix. Bookmark.